Jim Foster coaches the Mocs in last season’s NCAA Tournament. Photo courtesy of University of Tennessee at Chattanooga Athletics. Jim Foster enters his 40th year as a collegiate head coach this season. He is eighth on the NCAA all-time coaching list with 886 wins. He has a .724 winning percentage and has guided 28 of his teams to postseason appearances – 27 of them in the NCAA Tournament. A Pennsylvania native, Foster graduated from Temple University, served in the Army and was a high school coach before accepting his first head coaching job at St. Joseph’s University in 1978. 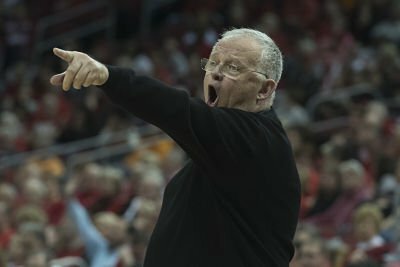 He became the head coach at Vanderbilt University in 1991, and over 11 years compiled a 256-99 record while guiding the team to one Final Four, four Elite Eight and three Sweet 16 appearances. In 11 seasons at Ohio State, Foster was 279-82. This will be his fifth year at Chattanooga. Foster has an extensive history coaching for USA Basketball that dates back to 1987. He has coached or been the assistant coach for the Olympic Team, the World University Games team and the Junior National Team, among others. He has a coaching tree of giants, as both Women’s Basketball Hall of Fame coaches Geno Auriemma and Muffet McGraw were his assistant coaches at St. Joseph’s. Foster was inducted into the Hall in 2013. He is married and has two sons and two grandsons. What got you into coaching originally? I was generally nudged in that direction by a lot of folks. The first year I coached, we had a CYO basketball team coach quit halfway through the year, and the pastor of the church made me a coach. So I was a coach at 13. I coached a couple of teams as a junior in high school. I coached boys at that time. I coached an inner city league in southwest Philadelphia. I coached the baseball team too. I’m originally from Canada and I came here at five years old. I was on the freshman basketball team in a high school that had 6,000 students. I was the last player cut as a senior. Was it easier to make a transition from high school to college coaching in the 1970’s? Yeah, but what made mine a little bit different is that I’d been in the Army and I was still pursuing my college education. I didn’t have my degree when I got the job at St. Joe’s. I was working, going to school and coaching. I’ve always said that you do what you have to do to do what you want to do. Forty years is no short amount of time. Did you ever envision you’d be coaching this long? No. I think I was the same way looking forward as I am looking back. Habit is habit. It became what I did, and it’s what I wanted to do, but I had to work. I ran a group home for boys, I ran a restaurant at the beach, I surfaced tennis courts. All that could make money was what allowed me to coach. In my last year in high school had 17 years of credits at Temple University. I bartended two nights a week and I ran a group home for neglected boys. All of that while you were in high school? What is the lens like for you, looking back over four decades of coaching? Players are essentially the same, though everyone says they’re different. Other factors are different; parents are different. I don’t think players are different. I think the things that surround the kids is different. If you were mad at somebody then you wrote a letter, and by the time you finished you went to sleep, and when you woke up you decided it wasn’t a good idea and you didn’t mail it. Today the thoughts come out of your head and you say it before you’ve had a chance to digest it and think about it. I still think kids want to be coached. 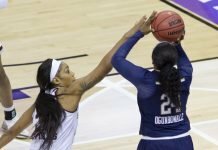 What are the differences between the women’s game when you began and the way it is now? Now players are very athletic, but the best players of those days would still be great. Carol Blazejowski……Gail Marquis of Queens College. There are more players that have talent today. What ways do you approach coaching differently now than you did 20, 30, 40 years ago? In what ways are young people different now, and how have you adjusted? I think you cannot be as demonstrative. You can walk players to a point without jamming it down their throats. The old model was that loud is good and louder is better. I don’t necessarily think that’s true. I don’t think Steph Curry is loud; he’s efficient and effective. If you go to a Geno Auriemma practice, 95 percent of the time he’s not raising his voice. If he is, it’s to motivate an individual or get the group to get better. You adjust as you grow, as you experience things. I don’t bring a whistle to practice. I raise my voice sometimes, but generally speaking I’m talking to you so you can hear me. There are times when I want to project and I want to be different. That’s not the norm anymore. Athletes today communicate differently. I’ve grown to appreciate it for what it is. But I don’t think their way is the only way, and that’s where you have to teach them. Technology comes too quickly and people accept it too quickly without evaluating what it really is. I think more people have wished they hadn’t tweeted something or created that Facebook illusion that you would imagine. Is there any one season or seasons that stand out in your mind? What is your greatest achievement in coaching? There are a lot of seasons that you look back on. I can look back on all four places I’ve been and there’s seasons that mean more than others. If I had to pick one I’d say ‘84-‘85 at St. Joe’s. Also, Vanderbilt ‘92-‘93. The most interesting aspect when you look back isn’t wins, losses or championships – it’s when something significant happens in a former player’s life. I had a player from Serbia at Ohio State, and a couple of months ago I got a call from her out of the blue telling me she got her green card. I was responsible for getting her here in the first place, so she wanted to tell me. So many of my former players called me after I was fired at Ohio State to tell me to keep coaching. What are the keys to building a winning program? You have to surround yourself with good people and maintain that, and understand that the list of people might need to change at times, because you want people to grow and move on and you want people to find their place. You have to get players that want to be coached. In any generation, I don’t think that’s a given. And you have to get better at choosing those players as you get older. You can’t just watch their drop step and their defense; it’s how attentive they are in practice. You’ve said that the best thing about coaching is watching young people grow both on and off the court. How do you facilitate that growth? One of the most important things is staying up to date and be aware of what their world is. I am often surprised at how old my peers are in how they think. I live in a world where they’re always 18-22. They’re optimistic about the future and about their thinking. Geno and I have discussed why people become more negative as they age. 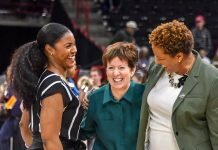 Your coaching tree includes Geno Auriemma and Muffet McGraw. How have each of them changed throughout the years, and how did they each become a coaching great after leaving you? It’s who they are and who they always were. Maybe I saw something early that I thought would help me, and help who I was with. But they never lost sight of what it was they saw. Their visions and their expectation drove them both, I had great moments with both of them. What keeps you going coaching? How long do you plan to continue coaching? I’ll evaluate it as I go. At some point it’s someone else’s turn, and you can’t be selfish about it. You have to make a decision. I’ll know when the time is. I really like my team this year. I think they want to be coached. I think the seniors are acting like they should, the freshmen are older between the ears than they should be. I think we have a good group. What are your preferred activities during your down time? A good book, a good bottle of wine and spending time with a good friend. If you come to argue and challenge, be prepared.